Emergency Evacuation Diagrams are vital to show emergency and evacuation information to your occupants and visitors as part of your facility’s evacuation plan, in accordance with AS 3745-2010. 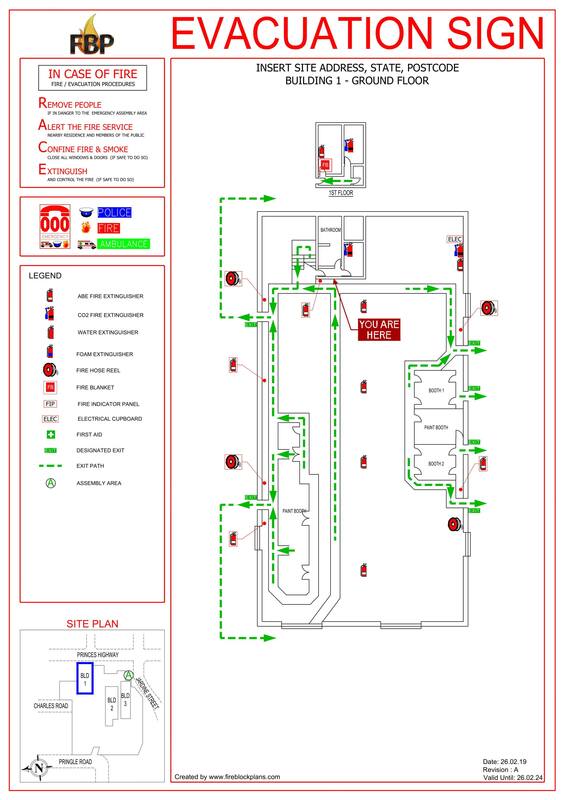 Fire evacuation plans need to clearly show evacuation procedures, fire equipment, details of emergency assembly points and who to call in the event of an emergency. Anyone conducting a business or undertaking at a facility should ensure they have evacuation diagrams in accordance with the requirements of AS 3745-2010. 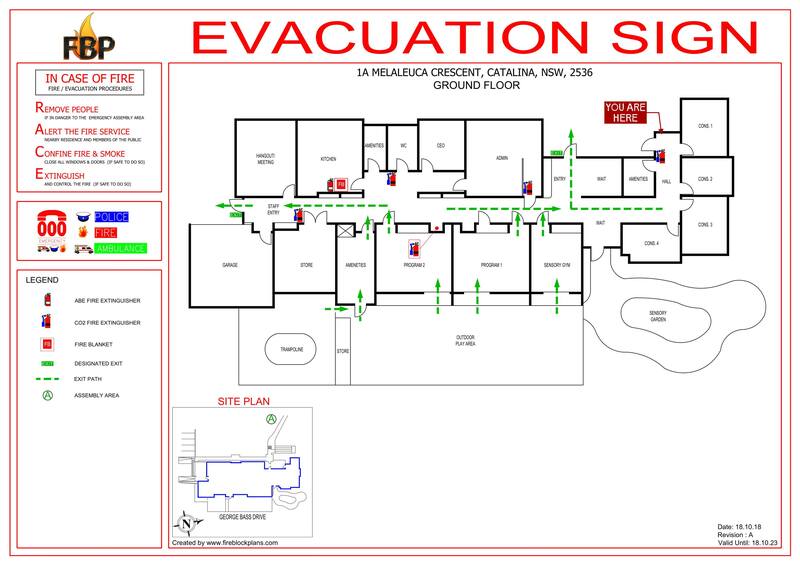 Evacuation diagrams must be displayed in locations where the diagrams can be viewed by occupants and visitors. The location and number of evacuation diagrams is determined by the Emergency Planning Committee. 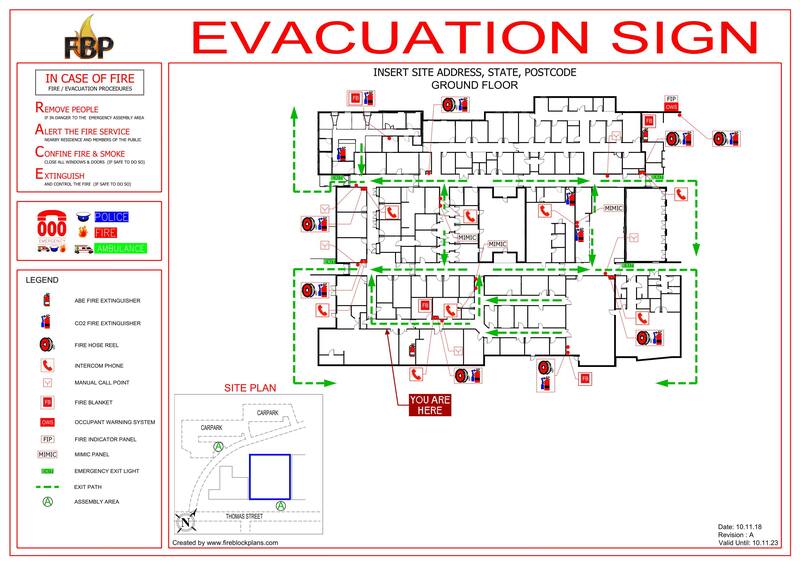 AS 3745-2010 lists a range of elements which must be included in the evacuation diagram, such as designated exits, fire equipment and the ‘YOU ARE HERE’ location. The evacuation diagram should be located at a height not less than 1200 mm and not more than 1600 mm above the floor. The evacuation diagram must be minimum A4 size (i.e., 210 mm × 297 mm). A pictorial representation of the floor/area of at least 200 mm x 150 mm or an area of at least 30,000 mm². The minimum size is A3 (i.e., 297 mm x 420 mm). A pictorial representation of the floor/area of at least 300 mm x 200 mm or an area of at least 60,000 mm². AS 3745-2010 provides the option to include additional information which may be considered by the EPC for inclusion on the evacuation diagram. These are not mandatory requirements. E.g. emergency information, such as emergency telephone numbers. Evacuation diagrams are often installed to fire doors (e.g. entrance doors to apartments, or hotel rooms, and fire stairs), as well as smoke doors and fire rated walls. Evacuation diagrams are often acrylic based signs or in an acrylic based poster frame. These are then installed on the doors using glue, screws or double-sided tape. Installation of evacuation diagrams on to a fire or smoke door should be tested or have a formal opinion obtained regarding how the fitting impacts on the performance of the fire door/fire wall/smoke door. Otherwise, the success of meeting the requirements of the Building Code of Australia and the relevant Australian Standards (e.g. AS 1905.1) may be compromised.